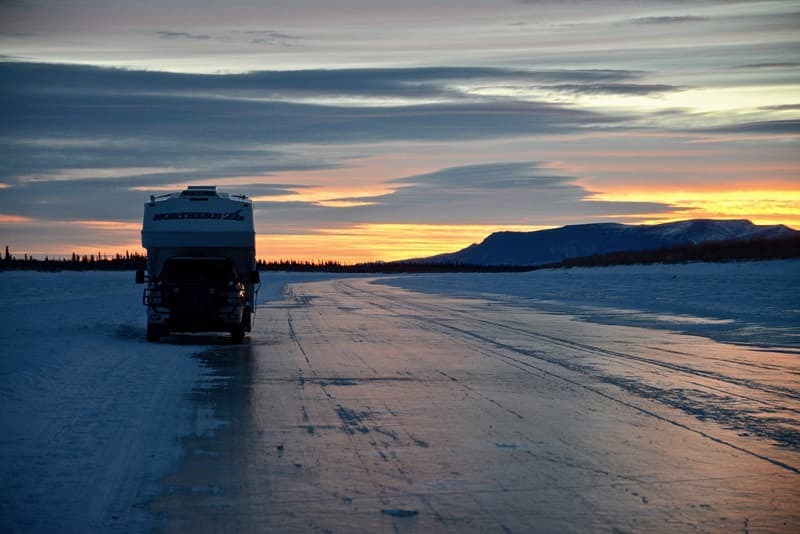 Jim and Nui Curry crossed the ice road to Tuktoyaktuk in their 2013 Chevy Silverado and Northern Lite truck camper. With temperatures reaching -45 degrees Fahrenheit, they pushed the capabilities of their truck and camper to the ultimate limit. Insane! Dangerous! Impossible! These are some of the words that ran through our minds when we learned about Jim and Nui Curry’s experience this past winter. When most of us where staying warm and toasty in our homes (or someplace south), Jim and Nui were crossing the ice road to Tuktoyaktuk. Created by the frozen Mackenzie River and parts of the Arctic Ocean, the “Tuktoyaktuk Winter Road” serves oil and gas operations in the upper reaches of the Northwest Territories, and supplies the town of Tuktoyaktuk and hamlet of Aklavik. The ice road has been made famous worldwide by the History Channel’s highly successful reality television series, Ice Road Truckers. With 10 seasons and 128 episodes, the show reveals the considerable risks and challenges of driving loaded semis across the extremely remote frozen road. When Jim learned that the ice road would be closed after this winter, he had to make the run. An all-season land-based highway between Inuvik and Tuktoyaktuk is scheduled to be completed this fall. When the road opens, the ice road will be closed permanently. If Jim and Nui didn’t go this winter, they would lose their chance forever. 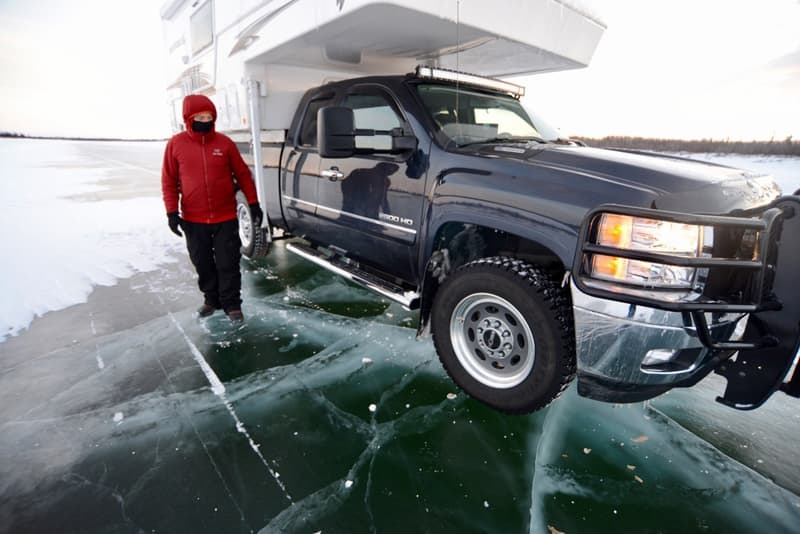 So how do you prepare a diesel Chevy Silverado and Northern Lite truck camper to drive across ice and endure temperatures that reach -45? Not to mention the question of how Jim and Nui wouldn’t freeze to death along the way. No matter how warm it may be where you are now, you might want to go get your winter coat. This is, by far, the coldest – and quite possibly the craziest – truck camper adventure story ever told in Truck Camper Magazine. Bundle up. TCM: You recently went on a six week truck camping trip to Canada’s Northwest Territories from mid-December through January. What compelled you drive to northern Canada in the dead of winter? Jim: We had been up on the Dempster Highway in the fall and we loved it. It is beautiful! But once we got to Inuvik, we couldn’t go any further. We wanted to go to Tuktoyaktuk, but you can only drive there in the winter when the road is frozen over. You can’t go to Tuktoyaktuk in the summer because you can’t drive across water. You can only go by airplane and boat. We started in Seattle and drove all the way up. 2016 was the last year for the ice road because they are completing the all-season road to Tuktoyaktuk for 2017. After this year there will be no need for the ice road. The all-season road will bring big changes for the people of Tuktoyaktuk. TCM: What was it like driving on the ice roads. Did your rig slide on the ice? Jim: It was pretty easy to drive on it. You can’t make sudden stops or quick turns. There are no mountain grades on the ocean so it was completely flat. My rig is heavily loaded, so it was good on the snow and ice. Before the trip I had H rated tires installed.